tasks, expectations, plans, and sin. Much of it is good. Some of it is excellent. other than giving me a grave in which to hide. I long for your Resurrection. and even no to some of the seemingly good. so that I may say YES to the best. in the Name of the Resurrected One: Jesus. Amen. The press would exegete every statement made by Trump (as they still seem to do) exposing the apparent errors… giving little attention to what his statements were meaning to his supporters. By taking Trump literally, but not seriously, the press (and Trumps opponents) were stunned that he was elected by those who took him seriously, but not always literally. I think that clever truism can be applied to the Bible. There are those who take the Bible literally, but not seriously. So, in the case of a tough passage like Matthew 5:27-30, there are those who take Jesus literally when He talks about gouging out eyes and cutting off hands. Because they take Him literally, they are forced to not take Him seriously. They point to a passage like this, and taking it literally, they find it barbaric, extremist, and ridiculous. They reject it… and likely reject much, if not all, of the Bible. It is vitally important to know when to take the Bible literally (which, of course, is most of the time). I want us all to take the Bible seriously; to do so requires an ability to know when not to take it literally. Sometimes we have Bibles with red letters for the Words of Jesus; maybe we should come up with a version that has different colors for what should be understood figuratively and what should be taken literally. Unfortunately, this is an area in which we don’t always find agreement, so we are going to need other tools to make these kinds of determinations. What does the context indicate? Is the passage intended to convey a fact or teach a principle? Does a literal or figurative meaning better align with other passages of Scripture? The figurative meaning of going to extreme measures to choose righteousness is clearly the best meaning in the Matthew passage. The premise gives us important context since an eye or a hand cannot cause us to sin; sin is a matter of our hearts and minds, not our organs and extremities. This passage is clearly not about setting rules or facts; this is a teaching passage… Jesus teaching radical ideas with radical illustrations. Nowhere in Scripture is self-mutilation promoted; in fact it is universally prohibited. The point is that Jesus was saying that while we might naturally be ruled by lust, this is not the system of His Kingdom. There is no room for the rule of appetites and lust in His Kingdom; His rule is love. There are a number of us at Northshore who have a palpable burden to pray for unity these days, especially in our congregation. We enjoy strong bonds of unity in our congregation that are vital to our continued effectiveness in ministry together; so we are not necessarily praying to solve a problem. We are praying to preserve that which is so precious to us: Our unity that is based in Jesus. Let’s be praying for unity. We live in days that seem to be marked by increasing division. As our federal government transfers power from the Obama administration to the Trump administration, some are fearful, others are exhilarated, while many deal with a mix of emotions and perspectives somewhere in the middle. These could be days when such division impacts us in our families, workplaces, and even in our church. We all have different backgrounds, experiences, and perspectives that shape our diverse positions. There is plenty of room at Northshore for a diversity of positions as we are unified in and through the Gospel. I believe our rich diversity makes us a stronger body; we need each other. Thank you for your partnership in the Gospel. Please join us in praying for unity! When I left church Sunday I noticed a guy sitting on a big rock next to our main, street entrance. As I thought about it on my way home, I put it together. I try not to think in terms of stereotypes… but this guy was a type. A messed up mop for hair, scraggly beard, squinty eyes from hours of starring at screens in the dark, the sort of look that one could assume that he smelled like dirty socks and Fritos… the guy was a gamer, playing Pokémon Go on his iPad. For reasons beyond my knowledge, the game designers determined that churches would be good locations for Pokémon gyms. I’m guessing that it is because church property is generally accessible to the public and nobody lives there. By the luck of the draw (or Divine providence?) Northshore is a gym. So that means that some of the multiplied millions who are playing the game need to stop by gyms like ours to advance in the game. There has been a steady stream of people stopping by Northshore’s campus, usually the parking lot, since the game launched on July 6. I thought, "why would anyone sit on that rock by the road?" And then it occurred to me… there is nowhere else to sit, at least not outside. Have you noticed that churches generally don’t have chairs outside of our buildings? It isn’t because we don’t value chairs. Pastors like me are keenly aware of our chairs (I have 242 in our auditorium; I know because I counted them myself). But we are often focused on just those chairs. That is where people get the really good stuff, where they hear me talk and listen to the music I provide. Of course those are the most important chairs. We want people to fill those chairs, several times each weekend. But what about some chairs by the door? I wasn’t really a Christian for the first twenty years of my life. I can remember that I didn’t feel all that comfortable sitting in those chairs in church auditoriums. I didn’t feel like I belonged. I didn’t know what to do or how to act. I figured that the people who were comfortable in those chairs were probably judging me. It could be that people who might not feel comfortable in the auditorium would like to sit by the door. So I put some chairs by the door. I even took a few more steps, including putting up a few signs, and providing a place to plug in (Pokémon Go really drains batteries). I’ve had a number of conversations this week in those chairs. In this case, I literally put chairs by the door. If you are a church leader, I’d encourage you to do the same. But there are all sorts of ways that we figuratively put chairs by the door, ways that we let people be part of our church in peripheral ways. There are several of those figurative chairs by the door right at the top of our minds at Northshore these days. We just finished up VBS; we think of VBS primarily as an outreach to our community… a way for kids and parents to check us out. We’re having an outdoor party on Saturday that we’re calling Hot Spot in the Lot, friends and neighbors are welcome to join us for food and fun. And on Monday we are more than doubling the distribution capacity for our food bank as we go to a weekly schedule. These are all figurative chairs by the door, ways to punch big holes in the hard shell that surrounds our church, ways that people can get a glimpse of the kind of people we are and the kind of God we serve. Let’s be sure to put chairs by the door… welcoming, comfortable places for people to enjoy that might just be a stop on the way to believing and belonging. Laurie and I are in a small group comprised of parents of millennials. This quarter we are reading David Kinnaman’s You Lost Me: Why Young Christians Are Leaving Church… and Rethinking Faith. It has been a great catalyst for discussion as we think about and pray for our children, their friends, and their generation. The book and our discussions has led me to think about our worship services at Northshore, specifically the preaching. So over the past two weeks we’ve conducted a few experiments. When it comes to preaching there are all sorts of approaches. There are some approaches that are more academic, while others are more related to everyday life. Some are shorter, while others are longer. Some produced by professionals (many more qualified than me), and other approaches that rely only on lay persons. Some are based in deeper research, while others are more spontaneous. Regardless of approach, the act of preaching is established in the Bible as a vital part of the life of God’s people. Preaching the Gospel has always been a central and vital part of church life, both the Church Universal and our congregation at Northshore. With that said, it is good to think about approach, looking for ways to make our current presentation of the timeless Gospel relevant in our days.… so, we are experimenting. Specifically we are trying approaches that might make these moments more of a dialog than merely a monologue… more of a conversation together rather than merely a speech. Not necessarily things we’ll always do, or might never do again based on how it goes… just experiments. This idea of more dialog is a significant element of communication in our times. We no longer settle for merely a few authoritative sources that provide information to us via a talking head. Gone are the days of just a few national news organizations, for example, that simply tell us what is going on. These days we expect many streams of information, as well as ways to enter into those streams ourselves. When we watch the news or even sports, the television screen usually gives us several views into the information with scrollbars and information blocks and multiple boxes and such. And then there are the second screens, as we watch social media feeds on our phones and tablets simultaneously with what is happening on the television screen. So, for those second screeners we offered this hashtag: #NSromans. When one uses this hashtag on Twitter during the preaching, they might even see the tweet on the screen. (Now if words like hashtag and live tweet and second screen sound like gibberish to you… don’t worry about it; this isn’t for you). The other, more low-tech, experiment is a Q & A. At the close of the messages, rather than giving time for our usual response in prayer (an altar call), I have opened the floor for questions related to the day’s message (as well as the other two messages in our series). This isn’t meant to be a game of stump the pastor, or a time to ask unrelated questions (for those who need to know if there were unicorns in the ark). Just a few minutes to consider the Scripture together as a community. We believe that the Bible is the Word of God, and it is vitally important to our lives. Furthermore, we believe that the Bible is for us all, to be read and understood and applied by us all… not merely by a few paid professionals. I’m glad people listen to what I have to say about it, and I’m glad that most seem to appreciate what I have to say about the Bible. But we are going to be at our best when God’s Word is more than just a monologue from a few of us, but rather a constant dialog among all of us. After two Sundays of experimenting, I’m pretty pleased with the results. The hashtag has had limited response. Most of the use has been my own, using Tweetdeck to preload tweets related to my message that are released during the message. While only a few others have used the hashtag, there are indications that people are watching the feed (second screen) and appreciate seeing the tweets on the screen during the message (we are using the Twitter function in ProPresenter). The Q&A has, so far, been the real success. The questions have been thoughtful and relevant… and it seems that my answers have been helpful. You can judge for yourself; the recordings for 5/1 and 4/24 available here. It seems that millennials have been the primary users of the hashtag (apart from this Xer). But, to my surprise, the participants in the Q&A have mostly been Boomer women. I talked with my son Alex about it and he had good advice, saying “just because we millennials aren’t yet participating in the Q&A does not mean that we don’t appreciate it.” He seemed to indicate that he and his ilk appreciated the effort, the transparency in the communication, and the invitation to enter the dialog. Furthermore, it seems, at least this far into the experiment, that he and his ilk were glad to observe the dialog… that he was encouraged by the kinds of questions asked and answers given. I’m pretty sure that we’ll use these tools, at least from time to time, in the future. I am interested in feedback. Have you observed these tools in use in other congregations? What makes it work really well (or not)? Are there other good ways to make our messages less like a monologue from a talking head? I’d be glad to hear from you. The Tribe in which I travel often thinks of Spirit-Filled ministry in terms of what is described in Acts chapter 2, that Day of Pentecost when the Church was born in that Upper Room. They were waiting just as Jesus had promised, and they were baptized in the Holy Spirit; they spoke in tongues, and boldly proclaimed the Gospel. While I agree that Acts 2 is vitally important, it isn’t by any means the first time that the Holy Spirit shows up in the Bible, not the first time people were filled with the Holy Spirit. The way I read it, the first time that the term “filled with the Spirit” shows up in the Bible is in Exodus chapter 31. It isn’t ascribed to Adam or Noah, not to Abraham, Isaac, Jacob, or Joseph, not even to Moses or Aaron. It isn’t ascribed to a prophet or priest or any other clergy the first time; the first one “filled with the Spirit” was Bezalel. When it comes to church work, it seems we generally think of the clergy as the ones really filled with the Spirit, those who preach and teach and prophecy and pray and sing and such. All of these should be filled with the Spirit, of course. But isn’t it interesting that the first recipients of the Spirit’s infilling are those who work with their hands? Bezalel was filled with the Spirit to lead and design and work. Oholiab was filled with the Spirit to stand at Bezalel’s side to help him. And a presumably large number of workers were filled with the Spirit to accomplish all the work set before them by the Lord. And so it is should be in our congregations. In our church I trust people sense that those who pastor and preach and teach are filled with the Spirit. But it isn’t merely the pastors. When Mark runs cables to repair the projector, and makes plans to improve our sound system, Mark is filled with the Spirit. When Gail bakes cookies, pouring love into each morsel that will be enjoyed by friends and tangibly welcomes our guests, Gail is filled the Spirit. When Eugene shows up at just the right time to lend a hand, Eugene is filled with the Spirit. When Charlene lovingly folds and collates bulletins every Thursday morning so that they are ready to welcome folk on the weekend, Charlene is filled with the Spirit. When Merlin artistically captures an image that so wonderfully communicates what it can mean to be part of our congregation, Merlin is filled with the Spirit. And on and on it goes. Let’s be sure to acknowledge the Spirit’s filling and the Spirit’s work through all that we do. Let’s encourage it in those around us. And let’s be sure to open our own hearts and heads and hands as the Spirit fills each of us for the Lord’s good worth through us. I was talking with my friend Merlin a while back when he said something along the lines of, “I think it is significant that when Jesus instituted Communion, he used bread and wine; it requires a great deal of skillful work to make bread and wine.” I’ve been thinking about that ever since, and I think Merlin is right; there is something really significant there. 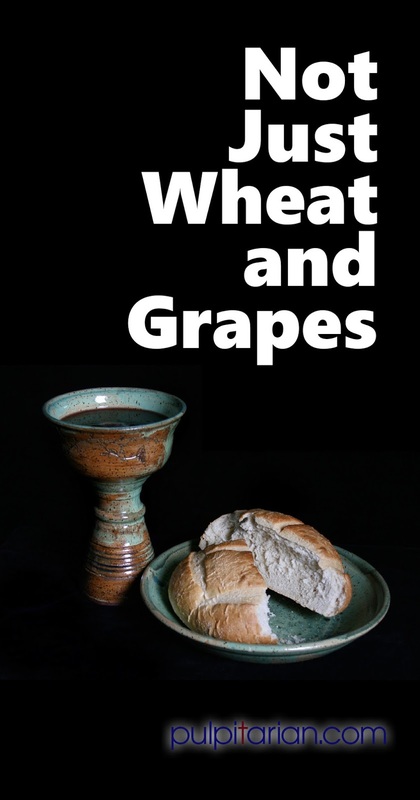 I suppose Jesus could have chosen wheat and grapes, or maybe even something found in the wild. 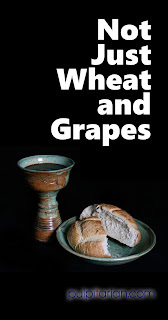 He could have made his point without any objects at all, or He could have miraculously produced the bread and wine Himself, like He had with other miracles in other circumstances before. But Jesus picked up the bread and the wine from the table that was prepared before Him, the work of the hands of others. While this certainly isn’t the main point of Communion, I’m glad that Jesus ordained this rich practice of the Gospel with these objects produced by human hands. In doing so, Jesus made a profound statement about the dignity of our work. Apart from the miraculous, I doubt Jesus could make bread or wine. He could probably apply the skills of a carpenter when needed, but the skills of a winemaker or baker were outside of His experience. In order for this Holy moment to take place, Jesus had to rely on the skill and labor of others. Skilled farmers had to produce the wheat and the grapes. Others had to prepare the raw ingredients, skillfully storing them and perhaps transporting them. And yet others had to apply the crafts they had learned, likely passed down through generations and practiced for years before perfected. Countless skilled hands, and hours of labor, were represented as Jesus took the bread and the cup in His hands. The work of hands like ours, then in the hands of Jesus, all present as Jesus taught His Disciples, as well as us followers through the ages, the glorious Gospel. And so it continues today. While I believe there is still room for the spectacularly miraculous, Jesus usually operates the same way, picking up the result of our work from the table prepared before Him. He takes it into His hands, and puts it into the work of the Gospel. We ought to consider all of our work like this. Whatever it is we work at, we should think of it as something that will ultimately be placed in the hands of Jesus for His good purpose.